Painted Jewels is proud to offer a selection of crosses that will truly be a unique gift for a baptism, christening, baby gift, birthday or special occasion. Our white crosses are 16 inches tall, and as with all Painted Jewels, are available in your choice of designs and color schemes. Truly one of a kind! Also, review our new Triple Layer Cross – a great gift or treat for yourself! A perfectly sweet gift for a new baby, Baptism, or Easter gift...or for any occasion! This precious cross measures approximately 5 1/4" tall by 4" wide, and 1" thick. Complete with ribbon for hanging, this is a perfect "I'm thinking about you" gift for anyone, anytime! We'll even add the child's initial for no additional charge! Order two and get free shipping on the second. This 16 inch white cross has a sweet scalloped edge and a simple design painted on it and comes complete with a ribbon for hanging. Custom painted in your choice of flowers, butterflies, ladybugs…anything a little girl desires! We can personalize this cross with a name and/or birthdate – we will discuss your design ideas before creating the cross for you. Very similar to the 16 inch cross, but with a smaller cross on top to give depth and more décor. As with all Painted Jewels creations, this cross is painted with your design preferences and décor in mind. Looking to make a bold yet simple statement in your foyer, living room, dining room…anywhere you have wall space? Try our Triple Cross. Handcrafted from three crosses (the largest measuring 22 inches tall by 17 inches wide), painted in black and warm mocha colors, then given a weathered look, this cross is a timeless accent to any room. Available in Fleur de Leis and other designs. Contact us for availability and design options. Details of each design may vary slightly from those shown. This lively cross is bound to be a beautiful focal point of any wall. The top layer is the inital of your choice, and then the other two layers are designed with stripes, dots, flowers, butterflies. It is available with stripes and dots for boys, or as pictured for girls. 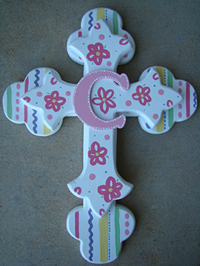 As always, we are here to customize this cross according to your design and color preferences. 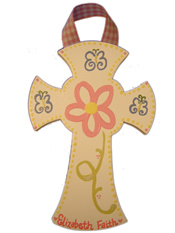 We offer from time-to-time other styles of wooden crosses, each handpainted with flowers and butterflies, or other themes, along with the child's name! These come complete with a bow for hanging, and can be created as part of a set along with growth charts or other Painted Jewels creations. Contact us for details, and availability.